Bend in Pedestrian Tunnel (SE1), William Eckersley. Courtesy Vegas Gallery. 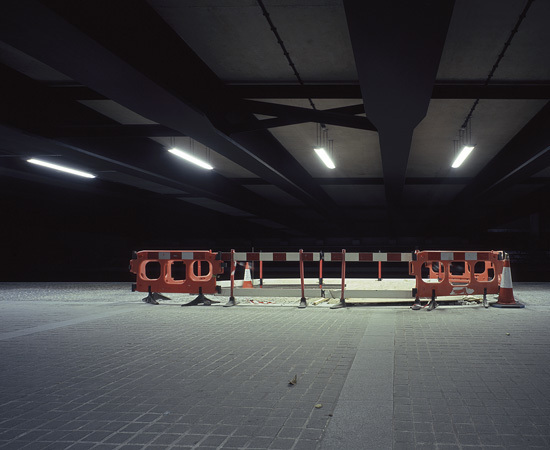 Cones and Barriers under Bridge (W2), William Eckersley. Courtesy Vegas Gallery. Elevated view of Housing Block (SE1), William Eckersley. Courtesy Vegas Gallery. Factory, Tree and Moon behind silhouette (RM9), William Eckersley. Courtesy Vegas Gallery. 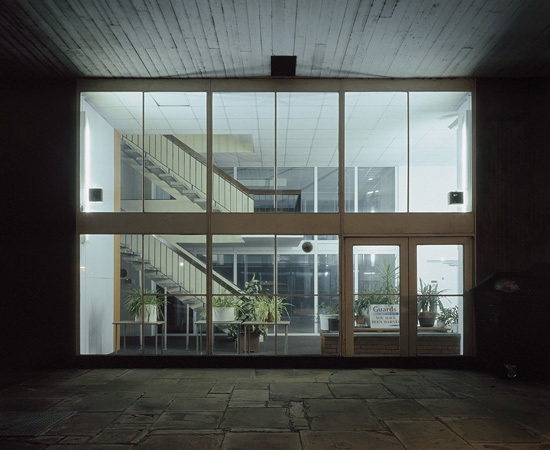 Housing Block entrance with Plants (SW1), William Eckersley. Courtesy Vegas Gallery. Trolleys in Car Park (CR0), William Eckersley. Courtesy Vegas Gallery. Wherever you go in London, one thing that can be guaranteed is that there will be other people there. London is one the world's busiest cities and with the Olympics just around the corner, it's about to get busier. William Eckersley has been hunting around London at night to find the perfect shots that counter this viewpoint. It's important that he's included the postcode as part of the title of each work, otherwise sceptics might doubt their veracity. There is a sense of the post-apocalyptic in his photographs and it takes a short while to understand why this is the case. 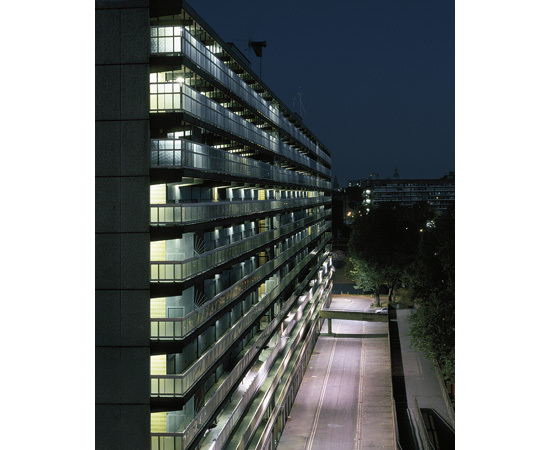 It's logical to assume that office blocks and car parks would be vacant in the dead of night but seeing them empty with lights blazing isn't a familiar sight to most. 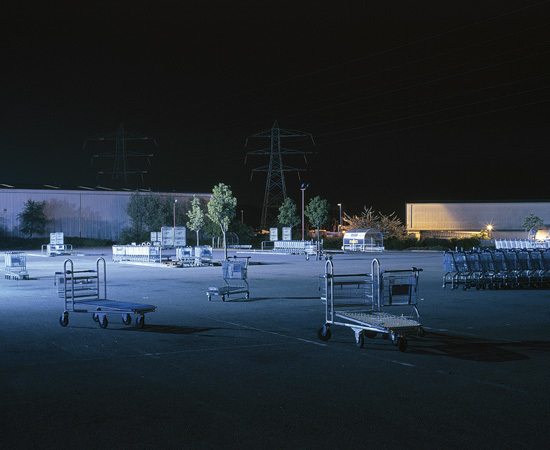 The most unnerving shot is of trolleys cast aside in a supermarket car park. It begs the question of why they haven't been tidied up. Was there some sort of incident that caused all the shoppers to abandon their trolleys and run for their lives? Similarly, the photograph of a street of Victorian houses appears ominous as the darkness of the trees in the centre of the shot draw and repulse the viewer at the same time. 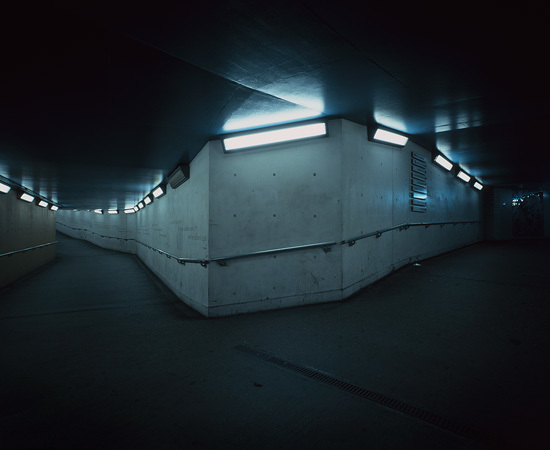 Eckersley has done an excellent job of bringing to life the dark and often scary emptiness of London that most Londoners won't have seen. 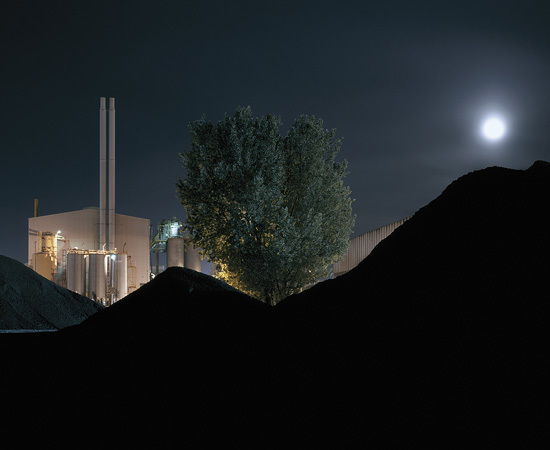 William Eckersley: Dark City is on at Vegas Gallery, 274 Poyser St, E2 9RF until 18 August. Entrance is free.